Automatically removes condensate from inside the trap to prevent damage to the trap from freeze-up of residual condensate. Compact size makes for simple installation. Remains closed during equipment operation, automatically opening to discharge condensate using gravity after the shut-off of equipment. Built-in screen protects the valve from trouble caused by clogging. 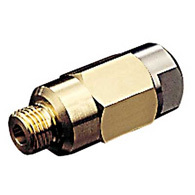 Prevents damage to steam traps by preventing freeze-up.